Welcome to Church On The GO on the world wide web. Leadership and Board Member's Code Of Practice can be found by clicking here. I believe in God, the Father Almighty, the Creator of heaven and earth, and in Jesus Christ, His only Son, our Lord:Who was conceived of the Holy Spirit, born of the Virgin Mary, suffered under Pontius Pilate, was crucified, died, and was buried. He descended into hell. The third day He arose again from the dead. He ascended into heaven and sits at the right hand of God the Father Almighty, whence He shall come to judge the living and the dead. I believe in the Holy Spirit, the holy Christian church, the communion of saints, the forgiveness of sins, the resurrection of the body, and life everlasting. Church On The GO - Is fundamental concerning the foundations of the blood atonement of Jesus Christ, repentance and faith, water and Spirit baptisms, the laying on of hands, the resurrection of the dead, the various judgments, and the literal, bodily coming of the Lord, along with His many other comings. Church On The GO - Is Biblically based and sound. Genuine prayer and worship in the Spirit will cause us to become a house of prayer. We desire to actively walk in the simplicity or singleness of the life of Jesus Christ, Who is the one and only God, Lord, and Saviour. Church On The GO - Has a desire to be pure in character and conduct, understanding the holiness of God. This fear of the Lord flows from a practical, daily relationship with and a love for God. The power of His new nature from within enables us to live right, not because we have to, but because we want to and get to! Kingdom righteousness is positional by imputation and functional by impartation. Church On The GO - Is charismatic, knowing that the Gifts of the Holy Spirit are power tools to produce fruit and to develop the Body of Christ, when used in divine order according to the Scriptures, to the profit and edification of all. Signs, wonders, miracles--the supernatural--are an important part of normal Bible Christianity. Jesus is the same, yesterday, today, and forever. He continues to do and teach. Church On The GO - Strongly emphasizes lifestyle evangelism and discipleship, being commanded by the Lord to make disciples of all nations. There must be a strong outreach with regard to home and foreign missions. Church On The GO - Wants to be active in its community. Through the guidance of the Holy Spirit, the local church is to be the vehicle through which God ministers His life and love to many of the spiritual, social, and economic ills of society, The Church is to be salt and light, a therapeutic witness to a sick world, releasing the resurrection life of Jesus. We are called to set the captive free. Church On The GO - Is a redeemed community or covenantal spiritual family made up of strong and healthy natural families, the basic unit of the Kingdom of God. High standards on marriage are very essential to the individual, to the home, and to the cause of Christ see: Genesis 2:24; Matthew 19:4-6; Romans 7:1-4; Divorce is discouraged and disapproval is set forth of Christians seeking divorce except for the cause of adultery/fornication. Circumstances of any individual case should be within the Biblical guidlines established in: Matthew 5:32; 19:9; and 1 Corinthians 7:15; Although God hates Divorce because of sin, the Eternal or Spiritual reflections on this topic should be made in the revelation light of our One Triune God: (Mark 12:29-31; One God) (Matthew 7:4-5; Luke 6:42; Our Responsibility) (Jeremiah 3:8, 14; Prophetic To The Godly Remnant - A Holy Nation - The Bride Of Christ - One from a city and two from a family -Revelation 21:2; 22:17). This Kingdom or government of God is the gathering of redeemed local church communities under one Head, Jesus Christ. This Kingdom is visible and invisible, being a present reality and having a future consummation, ever expanding until it fills the entire earth and eventually the whole creation. 2. We are to present the Full Gospel Message of the Israel of God (Gal. 6:14-16) to all nations (Mat. 28:19-20; Mark 16:15-20). 3. The diaspora is a means to an end: "…for this thing is from me.'" So they listened to the word of the LORD …" -1 Kings 12:21-24. 4. The diaspora (Isa. 11:12; Jhn. 7:35) were dispersed into Europe. In particular, it is only the natural (1 Cor. 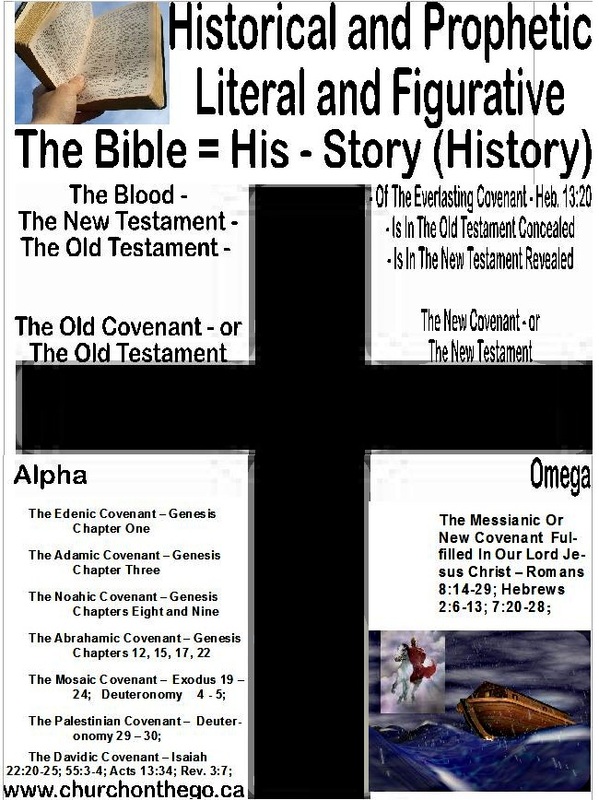 15:46-50) Anglo-Saxon, Germanic, Celtic, Scandinavian and related peoples that fulfill all the prophetic earmarks that identify them with being the literal physical descendants of the ancient people of Old Testament history known as Israelites (Genesis Chapters 48 & 49; Deuteronomy 7:6-8). These Israelites assisted in embracing the Gospel of Our Lord Jesus Christ and carrying this Good News, not only West, but to the ends of the earth. 5. Being that every person (including every natural Israelite) is born in sin, it is therefore necessary for each and every one to repent (Mat. 3:2; 4:17; Mark 1:15; 6:12). Repentance is required in order to receive the gift of salvation (Jer. 31:31-34). New Covenant Salvation is not a result of works or genetic lineage; it is by grace and it produces a new creation (Gal. 6:14-16). This is freely available to all peoples (Acts 2:21; Rom. 10:13). 2. We believe the Bible to be verbally inspired, the inerrant Word of God, and, when rightly interpreted by the Holy Spirit, to be the infallible rule of faith and practice. (Psa. 45:1; Ezek. 1:3; Matt. 24:35; Luke 24:27; Rom. 15:4; 1 Cor. 10:11; 1 Thess. 2:13; 2 Tim. 3:16; 2 Pet. 1:21). 3. We believe in the creation and subsequent fall of man, with the result that he, without God, is in a state of total spiritual depravity, unable to attain to divine righteousness by means of his own wisdom and strength. Unregenerate man, with a beast nature, needs a Savior. (Gen. 1-3; Rom. 3:23; 5:12-19; 6:23; Gal. 5:19-21; Eph. 2:1-3). 7. We believe in observing often the communion - ordinance of the Lord's Supper. This Eucharist, the Table of the Lord, is the ongoing celebration of the New Covenant (Matt. 26:26-28; Mark 14:22-24; Luke 22:17-20; 1 Cor. 10:16-17; 11:23-30). 8. We believe that sanctification is once and for all as well as progressive in nature: first, from the time of conversion, God Himself sets the believer apart by the blood of Jesus; then the believer separates himself unto a holy God by washing himself daily with the Word. The Spirit-directed life is one of detachment from this present world system, perfecting holiness in the fear of God (Matt. 5:48; 1 Cor. 1:30; 2 Cor. 6:11-7:1; Eph. 5:25-27; Col. 3:8-13; Heb. 9:12; 12:14; Jas. 1:27; 1 Pet. 1:15; 1 John 2:15-17). 10. We believe that the Pentecostal experience of the Holy Ghost Baptism is separate from and subsequent to conversion. God sends forth the Spirit of His Son into our hearts; this is Christ in and among all of us, the hope of glory. We believe that the initial evidence of this Baptism to be the historical and experiential distinctive of speaking with other tongues as the Spirit gives utterance. However, speaking with other tongues is not necessarily the evidence of a Spirit-filled life. The fruit of a genuine Pentecost is the writing of the law of God upon one's heart (Mark 16:17; Acts 1:4-8; 2:1-4; 10:44-46; 19:6; Gal. 3:14-15; 4:6; Eph. 5:17-18; Col. 1:27; and Ex. 19:1 with Lev. 23:15-22). 12. We believe that the gifts or manifestations of the Holy Spirit are the supernatural ministry of the Lord Jesus Christ, and that every member of the Body of Christ should flow in several of them. New Testament ministry is the outflowing of the indwelling Christ. The Church is called to a spiritual ministry of speaking, knowing, and doing. These manifestations enable us to talk like God, think like God, and do the works of God (Mark 16:15-20; Acts 1:8; 4:7-10, 29-31; 5:12; 8:5-13; 10:38; Rom. 12:4-8; 1 Cor. 4:20; 12:8-10; 14:1-40; Heb. 2:3-4; 1 Pet. 4:10-11). 13. We believe in Spirit-filled prayer and intercession, and that fasting (abstaining from food) intensifies prayer. Spiritual warfare is waged and won on the basis of Jesus' finished work. We are to cast out demons in the Name of the King. Satan, our adversary, is a reality, and was completely defeated by our Lord's death and resurrection. We are called to enforce Jesus' victory, to occupy until He comes, to call those things which be not as though they were, to prophetically decree a thing so that it will be established unto us (Job 1:7; 22:28; Matt. 4:2; 12:25-29; Mark 16:17; Luke 4:2; 10:17-20; 19:13; Acts 8:18-24; 13:6-12; 19:13-20; Rom. 4:17; 2 Cor. 2:11; 11:14, 27; Eph. 6:10-18; Heb. 2:14; Jas. 4:7; 1 Pet. 5:8-9; 1 John 3:8). 15. We believe that all authority centers in Jesus Christ and that He has delegated His jurisdiction into the home (domestically), the local church (ecclesiastically), and civil government. We believe in theocratic (God-ruled) local church government and order (elders or Five Fold Ministries, deacons or appointed ministries, and saints or people of God). Divine order in the New Testament maintains a plurality of eldership and leadership, but there is a set man at any given time with a distinctive anointing to father the flock of God. (Matt. 28:18-20; Acts 13:1-2; 15:19; Rom. 13:1-7; Eph. 1:20-23; Phil. 1:1; 2:5-11; 1 Tim. 3:1-13). 16. We believe in the full restoration of the five-fold ascension-gift ministries that Jesus Christ sent to equip and mature the Church: apostles, prophets, evangelists, pastors, and teachers. Their mission is to produce a perfect, full-grown, many-membered new creation Man in the earth, the manifestation or unveiling of the nature and ministry of Jesus Christ in His brethren. (Rom. 8:19-23; 1 Cor. 13:8-13; Eph. 2:20; 3:1-5; 4:11-16; Col.1:25-29). 17. We believe that the Kingdom of God is a present reality and will expand until the knowledge of His Lordship covers the earth, The Government of God is the purpose of God; it is the extension of His rule and dominion in the earth and the universe. The Church, universal and local, mystical and tangible, invisible and visible, is the instrument through which that purpose is to be realized. (Gen. 1:26-28; Dan. 2:44-45; 7:27; Hab. 2:14; Mark 1:14-15; Rom 14:17; Eph. 3:21; Heb. 12:25-29; Rev. 1:6; 5:10; 11:15; 19:1-6). 18. We believe that God's judgments are past, present, and future. Our sins were judged in Christ; it was appointed unto man once to die, and Jesus met that appointment. After that we are to stand in His presence and learn how to righteously judge ourselves and others. Thirdly, we shall be judged, for every man will give an account of himself; in that day, the Judge of all the earth shall do right, for His judgments are unto victory. In time to come, the Church will execute and administer the judgment which He is when we judge the world and angels. (Gen. 18:25; Eccl. 12:14; Matt. 5:13-16; 12:20; John 5:22; Acts 17:31; Rom. 2:16; 14:10-12; 1 Cor. 6:1-3; 2 Cor. 5:10; 2 Thess. 2:7-10; Heb. 9:27; 12:23; Rev. 20:12). 19. We believe that resurrection is past, present, and future. Our spirit was resurrected from a state of spiritual death and passed unto life when we were born from above and translated into His Kingdom. Our soul is being transformed, our minds renewed, from glory to glory by the Spirit of the Lord; our mortal bodies are presently being made alive by the same Spirit that raised Christ from the dead. Ultimately, there will be a resurrection in which He shall change these vile bodies and fashion them like unto His glorious body. Not all will sleep, or die; there will be a people or generation, like Enoch and Elijah, who experience the out-resurrection, a spiritual and moral resurrection while yet in the body. (Job 14:14; Psa. 16:10; 17:15; John 5:24; 11:25; Rom. 8:11, 23; 12:1-2; 1 Cor. 15; 2 Cor. 3:18; 5:6-10; Col. 1:9-13; Phil. 3:11, 21; Rev. 20). 20. Messianic believers in - Our Lord Jesus Christ - are the Church - the seed of Abraham, God's Holy Nation and Chosen Generation, the true Circumcision, the Heavenly Jerusalem, the spiritual Israel of God is you! Like Jesus, we are the Seed of the Woman, the Seed of Abraham, and the Seed of David; as such, we are heirs together of the grace of life, sharing His pain, His promise, and His power. (Rom. 2:28-29; 9:6; 15:8 with Acts 3:13; then Gal. 3:7, 16, 29; 4:21-31; 6:16; Matt. 21:42-43 with 1 Pet. 2:9-10; Phil. 3:3; Heb. 12:22-24; then Gen. 3:15; Matt. 1:1; Rom. 8:16-17; 1 Pet. 3:7; 1 John 4:17). 21. We believe that the Father has given the earth to the children of men. The earth is the Lord's; it belongs to Jesus and His Church, not the devil. The meek shall inherit the earth. As kings and priests, we shall reign on the earth. Heaven is the realm of God, and God is omnipresent Spirit; Heaven is nearer than men think. Therefore, we believe in the coming of the Lord, not the going of the saints; in the appearing of the Lord, to occupy until He comes - not the disappearing of the saints. Throughout the Scriptures, God comes to dwell with man. Jesus is coming now (in Spirit) to be glorified "in" the saints; He will come (literally) "with" the saints once His enemies are made His footstool, once He has received the early and latter rains, once we have come to the unity disclosed in John 17 and Ephesians 4, and once He has restored all things spoken by all His holy prophets since the world began. His coming is not "any minute" but "until" (a word denoting time) - no man knows that day or hour. (Gen. 28:10-17; Psa. 24:1; 37:3, 9, 11, 22, 29, 34; 110:1-6; 115:16; Matt. 5:5; 6:10; 24:36; John 1:51; 3:13; Acts 3:18-24; Eph. 4:13; 1 Thess. 4:13-18; 2 Thess. 1:6-10; Heb. 10:12-13; Jas. 5:7; Rev. 1:6; 5:10; 21:1-11). 22. We believe that there are some things that the Lord has yet to reveal to His Church. We have but crossed the threshold of the Most Holy Place. This is uncharted territory: we have not passed this way heretofore. Apostles and prophets will eventually make these things known to the Church in the seasons of the Lord. We remain open to be taught, corrected or adjusted in our vision (Josh. 3:1-5; Isa. 55:9; 1Cor.2:9-16; Eph.3:1-5,16-21). Church On The GO - Is a redeemed community... a covenantal spiritual family!